“Global Public Art” is one of the journal’s recurring columns. Each column is written by a Contributing Editor member of our board, appears three times a year, and engages a topic, methodology, or medium in which the author is expert. In each Global Public Art column, Caitlin Bruce discusses an individual public art project and location, analyzing each in terms of both global context and local politics. Our next column, by Malini Guha, will appear in our August 2018 issue. In The Global City, Saskia Sassen argues that, in the wake of the unraveling of nation-states, the city and region have become privileged “spatial units” in global political, cultural, and economic networks. Within the art world this means that curators and artists are often situated as hypermobile transnational agents, but also that in their host cities there must be appropriate infrastructure to stage their work for both local, regional, and international audiences. In my last column about Ser Humano/Ser Urbano I observed that the international is a fraught concept in legal graffiti worlds. In general, the international is affiliated with recognition, competition, and mobility. As a globally networked culture, the international is a horizon of possibility, but also a looming constraint. The challenges that the idea of the international poses for writers (graffiti practitioners) offers an optic on the larger tensions faced by cities, particularly those that occupy marginal or secondary positions in relation to global nodes. Similar to the fine art world, having an international presence (making work in countries other than your own) is a means of building cultural capital and cachet. Writers often publish their acceptances to events like Meeting of Styles on Facebook or Instagram to document such recognition. But at the same time, the international can be seen as parasitic on the local, a force that erodes the regional or local accents of graffiti style as well as face-to-face and intergenerational relations of mentorship. In this column, I discuss the way aspirations and anxieties about the international are deployed in framing discourses for León Guanajuato’s legal graffiti program, Muraleon. León is a city in the state of Guanajuato and is located in Central Mexico. Historically, León has been known for its shoe and leather industry. It urbanized starting in the 1970s, and its population tripled between the 1980s and the 1990s. From the early 2000s to the present its urban development has been characterized by a drive to become a hub for international business. CEOs of industrial firms (many run by American, German, Japanese and Canadian interests) across Guanajuato have made León a center for operations, most visible in one of León’s central avenues, Bulevar Adolfo López Mateos, which includes a mix of luxury hotels and conference centers, banks, high end malls, and expensive restaurants. The boulevard runs from the Del Bajio International Airport to Estadio León and the Cultural Center and Museum of Art and History, which houses the University of Guanajuato León campus, the Leather Plaza mall, and then northeast to the city’s wealthier Florida and Campestre neighborhoods. It has, in the last thirty years, become a city of malls, rather than public squares. Part of this renewed focus on urban art was its potential for global visibility. In Leónurban art discourses the international figures as a mark of success and recognition. Sub-director of the Municipal Youth Institute, Rodrigo (Lalo) Camarena, seeks to develop events and training that prepares young “urban artists” to compete at a “global level,” and to turn the eye of the global urban art world towards León, recognizing the high quality of work executed there. In Queretaro, too, Nueve Arte Urbano, a private organization run by businessman Édgar Sánchez, articulates the importance of having a mix of local, national, and international artists at their events. In Mexico City, the City of Mexico is seen as the ideal terrain for cultivating an international urban art scene, and tour groups like Street Art Chilango have capitalized on the rich offerings on the walls of neighborhoods like Colonia Roma, Condesa, and the Centro Histórico and a legal graffiti program housed in the city’s police department. In this post, I will go into greater depth about how the international is grappled with by Muraleon. In León Guanajuato, Mexico, there has been some level of city supported legal graffiti since 2001 (though models of support emerged in tandem with extreme repression). My second book project traces the history of this form of expression, paying special attention to the new lines of inclusion and exclusion that are demarcated when a formerly outlawed form of writing is given official support and even valorization (in particular contexts). In discussions with the many writers (recall, this is what graffiti practitioners call themselves) I have interviewed over the past six years, the international emerges as a mark of excellence or distinction. Penril remarked in a February interview, with pride, that León is “competitive at an international level now.” In graffiti worlds, the international is the scale for writing culture, but going “all world” is also mark of achievement and can supercharge one’s future mobility and fame. In the Mexican context, the international is given a particular charge given that, for many writers, travel outside the republic is limited due to border or economic constraints. The U.S., which is geographically proximate and a desirable location to paint – given the resonant history of graffiti in New York, Philadelphia and LA – is difficult to access given strict visa requirements. During my time in León during this most recent trip, August 2017 to February 2018, I primarily followed the activities of a group called Muraleon. Muraleon is a team of graffiti artists who work within the Diversity branch of the Municipal Youth Institute. Since April 2017 they have worked together to execute a series of projects with varying goals, contexts, and styles. Muraleon’s 2016-2018 team, led by subdirector Rodrigo (Lalo) Camarena, is comprised of 12-14 writers, some of whom work full time, others of whom work part time. The rest of the Diversity division includes a graphic designer, a social worker, and three break dancers. Housed in León’s Casa de Adolescentes, or Teen House, in the poor and violence-prone 5 de Mayo neighborhood southwest of León’s city center, Muraleon splits time between planning, designing, fund and material sourcing, and organizing projects in the offices and streets where they paint their works. Though members of the team are relatively mobile agents who travel to national and (some) international festivals, they rely on the infrastructure of Muraleon for gainful employment, friendship and sociability, and for developing technical and planning skills. The Youth Institute is a relatively recent government entity and it emerged out of the urban boom that hit León in the 1990s that also led to massive population growth, including the youth population. Initially called the Casa de Juventud (Youth House) and created from a gang crime reduction program called Programa Lobo (Wolf Program), it achieved Institute status in the early 2000s. The original offices for the Youth House were in the city center, across the street from Parque Hidalgo, where youth would gather for rap battles and breakdancing and rock concerts. The house was shut down in 2005. In September 2017, the house was remodeled and reopened. When documenting the work and the communicative practices of León, both how the writers within the institute articulated their role and vision, and how it was interpreted by external but affiliated agents (the mayor, the news media, academics) what becomes clear is that graffiti is not just graffiti. It is a form of urban practice that offers a lens through which one can observe the fraught and evolving status over imaginations of youth, citizenship, and the urban image. Chuen, Mictlarte. León, Guanajuato. Photo by Caitlin Bruce, November 2017. In Santillana’s statement we get a sense of how the Youth House emerges as a result of local exigencies (professional development, cultural expression, belonging, entrepreneurship) that are tied to global imperatives (competition, distinction, innovation). Santillana positions the “co-working” spaces in relation to a larger network of Silicon-Valley style tech culture. He envisions León’ as a contributing member of the global economic system. When he mentions León’s status as a “City of Education” he plugs León into a larger discursive network about what a “smart city” is: connected, updated, efficient. The Mayor also celebrated two other programs in the Youth Institute, focused on travel abroad and resources for cultural practices. He celebrated these programs for their “internationalization,” which served to educate the world about “what a culturally rich country Mexico is with enormous potential” and so that people can “stop making bad jokes about Mexicans.” In this offhand remark, the global is a stage for shaping and correcting perceptions. During this address Santillana did not mention the Diversity (Muraleon) program. But aesthetically, snapshots of projects by Muraleon decorated the new house providing the aesthetic fabric for the space. The importance that Muraleon would play for some of the mayor’s later rhetorical maneuvering was seen at the inauguration of a month-long project called Mictlarte, which provided visual substance for what a Leonese model of the global might entail. Mictlarte was a project in honor of Day of the Dead and painted on the central cemetery of the city, Panteon San Nicolas. Breaking with previous mural projects there that focused on the figure of LaKatrina, the skeletal woman who is iconic for Day of the Dead, Mictlarte instead focused on urban legends of León; prehispanic narratives around death; and the iconic film, Macario (Roberto Galvadón, 1961). 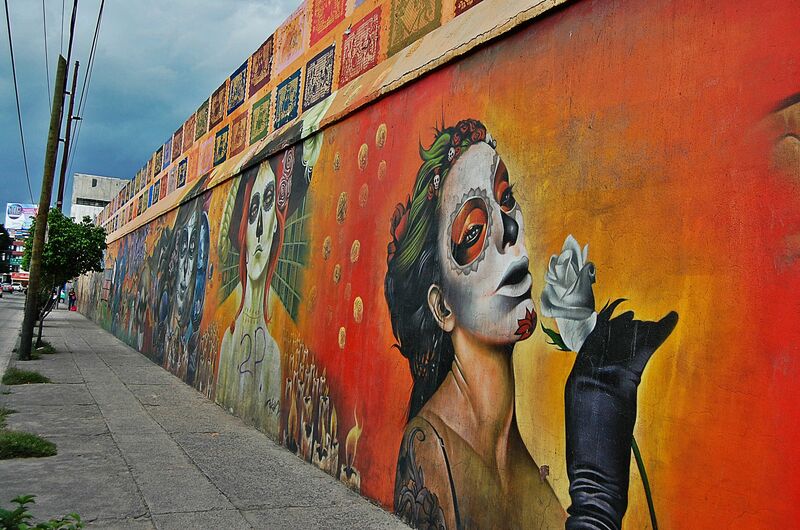 The block-long, two-story walls were covered with elaborate pieces, colorful flowers mirroring those used on the elaborate altares constructed in honor of loved ones, as well as images of sugar skulls and grave stones. Macario is a film about how a poor peasant man encounters and ultimately tries to cheat death. It was represented in a large painting of three scenes form the film: Macario offering Death the opportunity to share his turkey, Macario trying to prevent his candle (life) from running out, Macario pats his sick child on the head. These scenes were painted in blues and blacks and occupied the central portion of the wall. Four of the figures’ heads were extended outward from the wall using metal supports and plastic UV lining to create the effect of a bas-relief. To the left of Macario were prehispanic deities, warriors, and monsters (the ajalote and alebrije). To the left, urban legends like the Bride, a ghost rumored to walk the streets of the historic center mourning her untimely death in a flood; the Warlock of 5 de Enero, a warlock rumored to have been raised from the dead by the devil; and more iconically, La Llorona, a figure who drowns her children and then spends eternity weeping. The mural, which was later titled Mictlarte, a reference to the prehispanic deity figure Mictlantecuhtli, who is the lord of northern realm of the dead, offers a panorama of intensely local, personal, national, and international referents. While La Llorona and La Katrina are figures who have visibility in national and international film and literary industries, La Novia and the Warlock of 5 de Mayo are Leonese urban legends. While Coco (Unkrich, 2017)has popularized the Day of the Dead role for the alebrijes, in the case of this mural, visualized in the figure of two Xoloitzcuintli cogs leading souls to the afterlife, the name on the dog’s collar is that of a Leonese political figure’s deceased pet. Moreover, the inclusion of prehispanic figures like Mictlantecuhtli work to decolonize the Day of the Dead by emphasizing the role of indigenous culture and mythology in reckoning with death. Macario is enormously popular within Mexican public culture, something that for many mediates youth education about cultural orientations to death and dying. It was also the first Mexican film to be nominated for an Academy Award for Best Foreign Language film, indicating its function of bringing greater visibility to the Mexican film industry within global film flows at the apex of the Golden Age of Mexican Cinema. As Victor [Ayala “Kart,” a Muraleon representative] explained, the process is not simple. First one must imagine it, and then create/paint it in a drawing or an idea. And later, the great challenge of the creative process is to convince other to participate in it. And the most interesting is to convince them to do a project not based on individuality but to achieve a work that is not only important in Leon, but at a national and international level. How do you create a creative process without losing our identity? Conserving our identity? We don’t want our artistas urbanasto be a bad copy of foreign cultures. What we want is that we feel proud of what we are, proud of our land, of our name, of our legends, of our traditions…How do we motivate this process of transformation [while] remembering where we come from? How do we develop a modernity that strengthens our roots? In this speech Santillana tacitly enunciates how internationalism is a vehicle for promoting national or city distinction. It is desirable, but also threatening. And it is about competition. The fear of Leonese writers being “bad copies” voices the risks of promoting a kind of internationalism that is iterative rather than creative. Here, anxiety is voiced about the lure of the international, the risks it entails for homogenization, and, tacitly, a desire to perform a certain uniqueidentity that can set León apart from other global cities. Moreover, my own presence in León as a foreign researcher also was appropriated by the local press as evidence of León’s “international” status. A journalist, Adriana Carrera, wrote an article following a Luche Libre graffiti event titled, “El Arte Urbano Leonés es Motivo de Investigación y analysis,”“Urban art is the motive of research and analysis,” which noted that an “International researcher” was interested in the story of León. This impulse – to not only reach an international stage but to perform a certain excellence – was also palpable in a recent interview I did with the Muraleon team themselves. I asked them to reflect on the overall objectives they had crafted in April 2017 and the challenges and triumphs they had experienced in trying to reach such goals. One of the major projects from 2017 was the opening of the largest permission graffiti space in the world in León’s riverbed, the Malecón del Río. Muraleon member JHard noted that the mural event they planned to inaugurate the space, inviting 140 local and national artists to paint using shared color scheme and the theme of “ocean life,” was meant to “break the Guinness book of world records for the longest wall.” They did not break the record, but it was a “barrier breaking” project because it allowed the “urban artist” to do something “really big.” In León, the international figures as a form of recognition and distinction; a terrain for competition; and at times a threatening force of homogenization. Largely negotiated in the context of status, and contextualized within municipal growth schemes, it is hard to extricate the global from León’s search for global markets. Caitlin Bruce is an Assistant Professor of Communication and affiliate faculty with the Program in Gender, Sexuality and Women’s Studies; Cultural Studies; and the Center for Latin American Studies at the University of Pittsburgh. She received her PhD from Northwestern University. Her research is in the area of visual studies, affect studies, and critical theory. She is currently investigating the relationships between public art in urban spaces in transition within a transnational milieu. She is currently working on a manuscript on transnational public art. Caitlin Bruce argues that the city could not figure in public imaginaries as a space for authentic populism in the 2016 U.S. election in part because of its long-standing representation as a contagion in cinema.